A Florida suburb is being plagued by thousands of poisonous toads. Experts say the amphibians are bufo toads, also known as cane toads. Residents in the infested Palm Beach Gardens neighborhood worry toxins secreted by the toads will harm their pets and children. 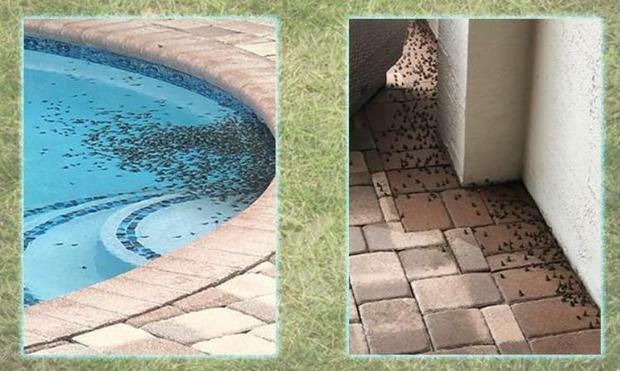 An invasion of poisonous frogs triggered an alert in one community in Palm Beach Gardens. Jenni Quasha, a resident in the neighborhood, contacted her homeowner’s association, but says she was told it is her responsibility to handle the problem. “There’s no swimming in the pool and no playing outside and enjoying the outdoors. Just hoping we can figure this out so we can put an end to it,” Quasha said.